UPDATE: Jenny’s success story is up! Go here to see her after photos! Today’s messy situation was submitted by Jenny! Go here to see other before photos of Jenny’s space. “Hello! I am excited to get some help with organizing this area of my house. The desk is one of the biggest dilemmas in the spare room. “The desk is currently housing all of my drawing, arts, crafts, and office supplies. The totes around it are holiday decorations, office supplies, file folders (important papers), and wedding memorabilia. “I like that we are using storage bins and file folders… but they are just sitting out on the floor taking up space! My ultimate vision for the space is a playroom/future big brother bedroom for our son. Therefore, just about everything that is currently in there will have to have a completely new solution. “I have suggested making wall shelves (or buying them) and my husband doesn’t want to do that. We have to be careful what we do to the structure of the house, as it is military base housing and we won’t be here permanently. 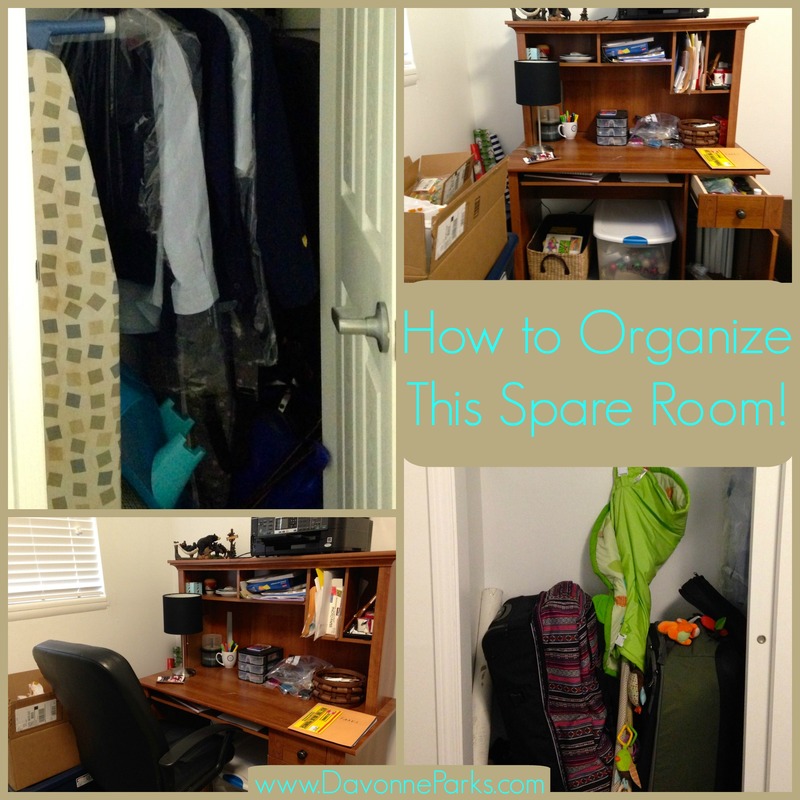 I know I could reorganize the desk and throw some things away but that won’t solve the issue of what to do with the desk, gun safe, large totes, and large baby toys when we need a guest room or when our son needs a new bedroom! I love that you’re thinking ahead with your storage options! I mentioned five ideas in my previous note to you about baby gear storage solutions, so today I’m going to focus on the rest of the spare room. It doesn’t look like you have a ton of clutter in your spare room, but if you start decluttering and purging items as you’re organizing, you may be surprised at what you can toss! Something else that jumped out at me is that your spare mattress is on the floor. You could probably find an inexpensive bed frame at a local furniture shop (without the headboard or foot board) so you can get your mattress off the ground and utilize under-the-bed storage! My husband Nathan and I hunted for a bed frame several years ago and our local furniture shop just gave one to us for free. Under the guest bed would be a perfect place to store things like your photos and gift wrap supplies! 3) Do what works for your family now. It’s excellent that you’re thinking long-term. I like to do that too! But, we need to be careful that we’re not looking so far into the future that we forget to do what works today. For example, it seems that having your spare room as a storage, guest room, office, and work-out space works for your family right now. Embrace that! Who knows – maybe you’ll move before you have another baby and needing two kids’ rooms won’t even be an issue. Or maybe the older sibling will really want to share a room with the baby (that’s what happened to Nathan and me AFTER we spent weeks preparing another bedroom!). Plus, if you do a full-home declutter, you’ll be able to purge a lot of items from your other storage areas and move things from your spare room to other storage later. 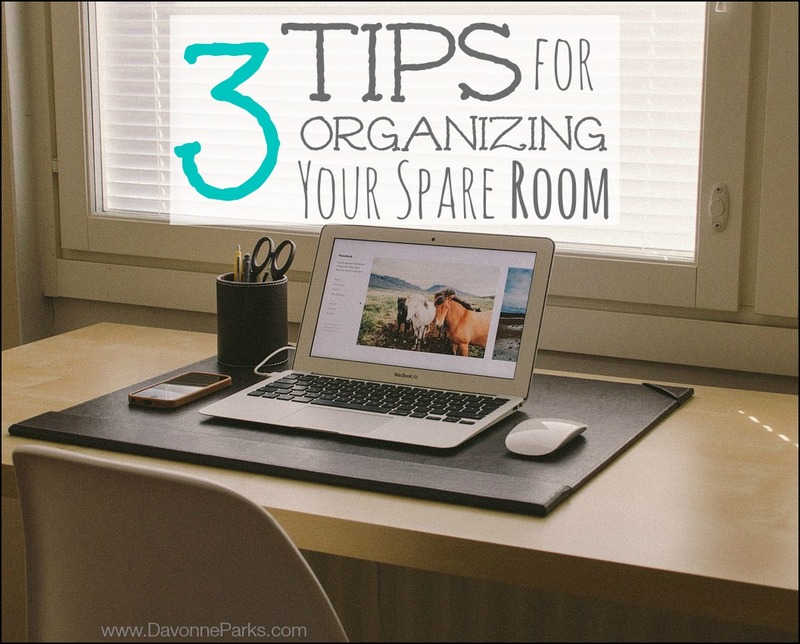 In the meantime, don’t let having full storage stop you from enjoying your spare room now! I hope this helps you, Jenny! I can’t wait to share your success story!